2015’s starting line-up for the 10k. Arnison Heelis are once again delighted to be sponsoring Appleby Rotary 10k and Eden Valley Fun Run which will take place on Sunday 26th June 2016 and raises money for local schools and charities. Both Eden Runners and Keswick AC have this year made the race one of their club championship races so we are expecting a great turnout and maybe even more new course records! 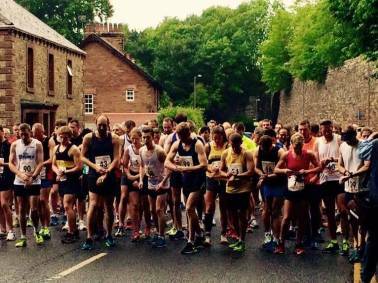 Last year’s event saw a record turnout for both races with almost 400 runners taking to the streets of Appleby-in-Westmorland. The weather could have been better for the spectators but it made for ideal running conditions for the competitors. Kurt Heron of Tyne Bridge Harriers destroyed the men’s 10k course record coming first with a time of 34:18 whilst Hannah Horsburgh of Keswick AC, won the women’s race with an incredible time of 37:30 and also broke the women’s course record. Both athletes received a £100 cash prize for their efforts, in addition to their trophies. In the 4k fun run 12 year old local boy, Harry Chambers, was victorious with an incredible time of 15:34. The shields for the first local male and female were presented to Tom Fynn of Howgill Harriers and Kathleen Gough, unattached. If you would like to take part in either event just visit Appleby Rotary Website for more information.